One thing I disliked about Windows is that the system tends to become slower over time. I looked up ways to speed up the performance of my PC but they involved disabling features to free up resources. But as softwares update, they eventually use up those resources anyway. Back in high school, I had an old Windows XP machine with 2GB of RAM that could run Firefox, a video game, and Yahoo Messenger with no noticeable lag. Now, Firefox alone can use up 2GB of RAM easily with just some tabs open. My friend and I built this PC several years back so I thought maybe it’s time to upgrade. The good thing about building my own computer is that I could swap out components when better options became available. I upgraded the power supply and graphics card recently so the oldest parts I have are the motherboard, CPU, RAM, and hard drive. I downloaded Speccy to see the exact models of those components. It’s been years since I installed them so I did some quick Google searches on them. My RAM is just the standard DDR3 and the hard drive is just a regular 1TB HDD that I bought on Amazon. Nothing much to think about there. On the CPU model, I found an article on Wikipedia. It’s the 3rd generation of Intel i7 released back in 2012. Intel currently has the 8th/9th generation available so my CPU is ancient by current standards. My motherboard is a bit special because my friend found it for a relatively cheap price. The brand name is ASRock, which I didn’t heard about before I got it. But given the fact that we spent a lot of the budget on the CPU itself and the motherboard had good reviews on both Amazon and Newegg, we bought it anyway. ASRock actually has a page listing its specs here. It’s a mini-ITX small form factor motherboard with two RAM slots and can only support 2nd and 3rd generation Intel CPU. Given my specs, I had the option to upgrade any or all of those components. The most obvious upgrade is the CPU since new processors these days have better architecture, clock rate, and softwares. The caveat is that in order to upgrade the CPU, I will literally have to upgrade everything else. 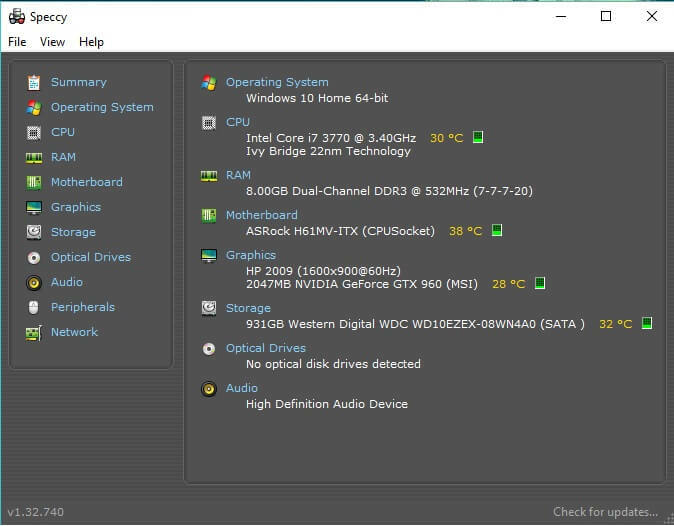 My motherboard can only support up to 3rd generation Intel processors, I will need to get a new one that’s compatible with the new processor. Adding on top of that, I may also have to upgrade the RAM to DDR4 since my DDR3 might not be compatible with the new motherboard. Another point I thought about was switching over to AMD since their processors and motherboards tend to be less expensive than Intel. At this point the process took me more time to research than I intended. That’s one of the negative with building my own computer, there are just too many products available and comparing them is a laborious process. I will need to sit down at one point to list out my budget along with using PCPartPicker to see what options I have. For now, the simplest future proof upgrade I can see is upgrading my hard drive to an SSD. SSD prices are getting cheaper and a 500GB SSD on Amazon is only around $60 to $70. Even though my motherboard only supports SATA II, it will still be much faster than what I have. Later when I upgrade to a new motherboard that supports SATA III, it will be even faster. My PC is still working just fine now so I have enough time to save up for big upgrade that will last me a long time.